22 May 1991 is where it all began at international level for an Irish rookie who would go on to become a legend. 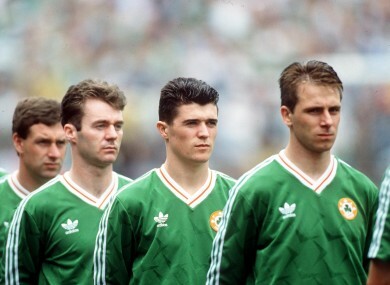 Roy Keane (centre) lines up before the game against Chile. TODAY MARKS THE 25th anniversary of Roy Keane’s debut for Ireland at senior level. Jack Charlton chose to blood the 19-year-old Nottingham Forest player in an end-of-season friendly at Lansdowne Road against Chile, with the team coming towards the end of their ultimately unsuccessful Euro 92 qualifying campaign at the time. The achievement highlighted Keane’s speedy progress at club level, with the Corkonian only having joined Brian Clough’s side from Cobh Ramblers for a reported fee of £47,000 a year previously. The match itself finished 1-1, with David Kelly’s 81st-minute equaliser cancelling out Fabián Estay’s 64th-minute opener. It took Keane little time to become a key member of the team, as he was named Ireland’s player of the tournament after the 1994 World Cup just three years later. Keane would, of course, go on to win several titles with Manchester United, becoming an Irish footballing legend in the process. His finest moment in a green jersey arguably came in the 1-0 2002 World Cup qualifying victory over Holland, before missing out on the subsequent tournament in controversial fashion. Keane, in total, scored nine goals in 67 appearances for his country, and is now the team’s assistant manager. Subs: Paul McGrath (Aston Villa) for O’Leary, Alan McLoughlin (Southampton) for Houghton, Tony Cascarino (Aston Villa) for Sheedy. Email “It's a quarter of a century since a promising teenage Forest midfielder made his Ireland debut”. Feedback on “It's a quarter of a century since a promising teenage Forest midfielder made his Ireland debut”.